Trucks are a major expense for lawn care operators, and many begin each day ensuring their investments are well cared for. The three-minute 360 is a full inspection of the truck to check fluids, tires and general maintenance items. Technicians handle any minor maintenance in the shop before they head off for the day. The inspection details are kept in an Excel checklist and reviewed regularly. Lush Lawn is an $8 million company with five locations in southeast Michigan. It provides 70 percent lawn care and 30 percent tree care to a 90 percent residential customer base, and counts 40 trucks in service across all five branches — Ford, Chevy and GMC 3/4- and one-ton pickup trucks as well as RAM ProMaster 3500 vans. Upfittings and equipment, including spray rigs, are checked and maintained just as often as the trucks, Zielesch says. The crew checks all hoses and straps for fraying or breaks and the fluids and oils for any motors or pumps on the equipment. Spray tips are checked for clogs and proper flow. Aside from the daily maintenance check, the company performs routine maintenance every 3,000 miles. For Lush Lawn’s more extensive truck repairs, the company negotiated an agreement with a national auto shop chain, and all Lush Lawn branches receive the same pricing on repairs and maintenance at each auto shop location. Even with regular maintenance, lawn care trucks have to be retired at some point. Erik Hutson, branch manager of Lush Lawn’s Grand Blanc location, says vehicles are often phased out around the 10-year mark. After a review of the truck’s maintenance logs, which include tracking the price of ongoing repairs, the company analyzes whether it makes more sense to purchase a new truck. 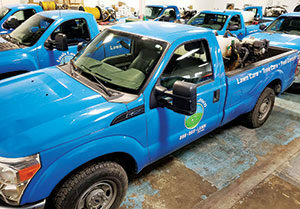 Mark Utendorf, owner of Emerald Lawn Care, says his trucks undergo a biweekly inspection that includes a visual check of the tires, oil level, brake lights, turn signals, undercarriage, warning lights and hitch and rider racks. Emerald Lawn Care is based in Rolling Meadows, Ill., and primarily provides lawn care services with some perimeter pest and tree and shrub care for a 99 percent residential clientele. The company has 13 employees and runs eight trucks — Chevy 2500s, Chevy 3500s and Ford 250s — which range in year from a 1999 model to a new 2018. A little more than two years ago, Emerald Lawn Care moved next door to an auto shop, which it uses for all truck repairs the firm can’t handle in-house. As for the exterior of the truck fleet, Emerald Lawn Care’s pickup trucks feature a spreader rack on the front, so technicians can easily move a push spreader on and off the vehicle without having to store them in the back of a truck and maneuver them around the Permagreen equipment. This setup does have some drawbacks, however. With a spreader rack on the front, fertilizer prills may blow out of the hopper and end up wedged in the trucks’ radiators, he says. His crews back flush any fertilizer out of the radiators with a regular hose — not a power washer. Loose fertilizer is not permitted anywhere in trucks, and if there is a fertilizer spill, the truck is emptied, blown off and washed immediately. Emerald Lawn Care also applies Boeshield, a specialty lubricant created by aerospace builder The Boeing Co., to trucks to offer another layer of protection. 1 Comment on "Keep on trucking: Maintaining lawn care fleets"
Wow. Loved the idea of three-minute 360. Thanks for sharing it with us.